Pre-configured Octavio systems are also available featuring these SBCs in the Pandora enclosure. Pandora is a compact, light weight, rugged enclosure system for Diamond Systems’ PC/104 form factor single board computers. Pandora offers a unique approach to packaging by eliminating most internal cables. This speeds up the assembly process and improves reliability and ruggedness. In the Pandora system, one end cap serves as a base plate on which the PC/104 stack is assembled with the panel I/O board atop the stack. Once the stack is complete, it is inserted into the enclosure and bolted into place with direct connections to both the top and bottom of the enclosure for extra rigidity. The rear/bottom panel provides convenient holes for mounting the stack. The Pandora enclosure, coupled with the panel I/O board, features fast and easy assembly because most or all internal cables can be eliminated. Rather than requiring the installation of special corner mounts or forcing the stack into a set of corner guides, the entire stack is bolted directly to the front plate of the case, forming a rugged, easily-handled assembly. Our unique Panel I/O Board system is offered on most of our PC/104 single board computers and provides industry standard I/O connectors for the I/O, including CRT, Ethernet, USB, Serial, Parallel, PS/2, and data acquisition. Status LEDs and PC speaker are also included. 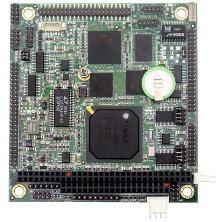 For use with Aurora SBCs is the Aurora panel I/O board, PNL-AUR-01. For use with Athena III SBCs is the PNL-ATHE-01 panel I/O board. 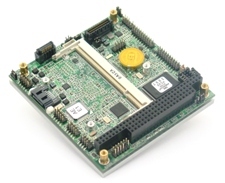 For use with Helios SBCs is the Helios panel I/O board, PNL-HLV-01. For use with Rhodeus SBCs is the Rhodeus panel I/O board, PNL-RDS-01. The panel I/O board can also accommodate I/O output from one or two add-on PC/104 modules without requiring costly and time consuming custom enclosure design. One pin header can be used with any PC/104 board with a 50-pin I/O connector. Power input is through a 4-pin Molex connector. Both regulated 5V and unregulated 7VDC-28VDC inputs are supported. An on-off power switch is provided. The 1.7"(43.18mm) case accommodates the SBC, the panel I/O board, and an optional notebook hard drive. 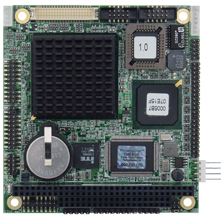 The 3.0"(76.2mm) case accommodates the SBC, panel I/O board, up to two additional PC/104 boards, and an optional notebook hard drive. and an optional notebook hard drive. boards, and an optional notebook hard drive. Interior view of Pandora case showing ACC-HDDMOUNT accessory board for mounting a notebook hard drive conveniently on the PC/104 stack. Case lengths accommodate PC/104 boards with stackthrough configuration (long pins on the bottom side) at the bottom of the stack so no special effort is required to obtain non-stackthrough boards or to cut the connector pins. The length is also sufficient to enable mounting a notebook hard drive below the bottom board and attaching it to the rear end plate. The 3.0" length is designed with the intention of accommodating two additional boards. A typical configuration might include a VGA board and a DC/DC power supply for use in mobile applications. However any two boards can be installed. The interior cavity is wide enough to install any PC/104 board with almost any I/O connector, including pin headers with ejector latches. Each Pandora case includes case body, front plate to accommodate the panel board, rear plate, and all mounting hardware (screws and spacers). Additional end plates are available separately. Installation of boards inside Pandora is as follows. The panel I/O board first mounts on top of the SBC. Spacers are installed between the two boards and above the panel board. The panel board is then fitted to the case front plate and attached using 4 screws driven into the spacers as well as screwlocks driven into the 7 Dsub connectors on the panel board. In this fashion the entire SBC assembly is mounted directly and securely to the end plate. This assembly can now be easily attached to the front of the case body using 8 flathead screws. (All necessary hardware is provided with the case and/or the panel I/O board.) The rear plate can now be attached with 8 more screws, and the assembly is complete. The following cross-section drawings illustrate the relative positions of the components inside the 1.7" and larger cases. These can serve as a quick overview of the proper assembly method. We recommend you start with the face plate and work your way down to ensure that all the mounting hardware aligns properly. The standard Pandora package includes a front end plate containing cutouts for use with the panel I/O board specific to the SBC (models with and without the data acquisition cutout are available). The rear end plate contains PC/104 mounting holes that may be used to attach to the bottom of the stack using additional spacers if desired for extra rigidity, although for a 2-board system these are not needed. The lengths of the cases have been selected to allow the use of standard PC/104 spacers, such as Diamond Systems' SPC-104. Each Pandora case includes a case body, front plate to accommodate the panel I/O board, rear plate, and all mounting hardware (screws and spacers). Additional end plates are available separately. Only 1 small cable is required!